Perfect for people you like, love or loathe because you get to customize the message and type of glitter and confetti. Plus, it can be sent anonymously or you can take credit! This is the Original Christmas Card Glitter Bomb, featuring a hand-written card, festive decorations and personality. And personality goes a long way. Thanks to our ingenious breakaway compartment (not shown), glitter and confetti is specially loaded into a premium, full-size Christmas greeting card so it will pop out when opened. This is not just an envelope with cheap glitter poured into it. Glitter and confetti only comes out when the card is opened. Surprise! A Christmas-colored cloud of sparkly fun pops out all over the place. They'll be finding festive, glittery specks for days, weeks, maybe longer. A reminder of the day they got glittered by someone with big-time Christmas spirit. What makes our Christmas Card Glitter Bomb so special? Real, Premium, Full-Sized Christmas cards! Customized and personalized to order. Sent anonymously for a fun mystery – OR you can choose to take credit. Many glitter and/or confetti types, including cool, festive, holiday styles. Glitter and/or confetti actually pops out when opened — it's not just an envelope with loose glitter. 100% manufactured, printed and funkified in the USA. Nice Christmas stickers on the envelope make it even more personal. Oh yeah, we're spreading glorious, sparkling Christmas cheer. Rest assured, this will not be overlooked as junk mail. This will be enthusiastically opened! 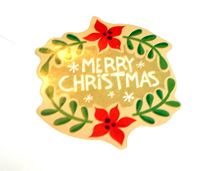 We also offer a hugely popular Kids Christmas Confetti Card that they LOVE. Provide your personal message to be hand-written inside the card. Let us know if you have any special requests. Real people (that’s us) read this and we will do everything we can to make this special. Examples: Draw something inside (heart, emoji, holiday, etc) or add Stickers (Star Wars, Sports, Rainbow, etc). We aim to please. Choose the type of glitter you would like us to use the amazing card you are ordering. Confetti is larger and easier to cleanup and can have shapes. Add a Fake Lottery Ticket? Ho Ho Holy Cow – did I just win $5000 dollars?! Fake scratch off lottery tickets have a prize amount between $5000 and $50,000, depending on the ticket. They won’t know it’s a fake until they read the small print on the back – most likely after they’ve run around screaming that they won! Customize your card with some of these fun add-ons. Pokemon, baseball, football and superhero cards include random new or classic cards (will be inside a card sleeve). If you want this shipped to your address so you can deliver it yourself, then choose this option. We will ship it directly to you within another envelope.